The first thing you need to know about Energy Duck is that Energy Duck does not exist. It’s just a design, an entry in the Land Art Generator Initiative (LAGI), a competition to design and construct public art installations that also serve as sources of large-scale clean energy generation. So for now, file it with the other wonderful, terrible things that live on the internet, like the trampoline bridge on the Seine and the city buses with roof gardens. 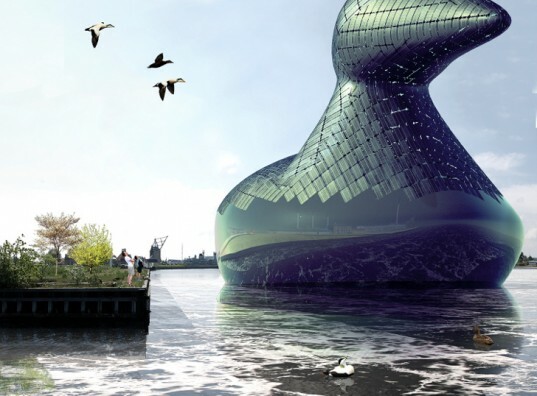 If it gets built, though, Energy Duck will have the ability not only to provide solar and hydro power to Copenhagen’s public grid, but to fuel the nightmares of Danish children for decades to come. A London-based team of artists, Hareth Pochee, Adam Khan, Louis Leger, and Patrick Fryer, modeled the sculpture on the common eider duck, which is found in the waters of Copenhagen. The Energy Duck, which is planned to be 12 stories tall (!) and constructed around a lightweight steel frame, with very lightweight steel supporting a skin of photovoltaic panels, would float in the city’s harbor. At night the duck would be lit by LED lamps that change color, with the color pattern undulating according to the output of the hydro turbines. Visitors would be able to move around the inside of the duck. All this is well and good, I suppose. Sustainable energy produced by a plant floating offshore is a great concept. But as a person who lives in a 7-story building near a river, the idea of a huge, black, armored duckie larger than my apartment building floating nearby is somewhat less than appealing. It’s terrifying, in fact. The fact that it would turn into a glowing, pulsing, rainbow hippie duck by night helps matters not at all. I do kind of hope that Energy Duck gets built. At the very least, it would provide endless entertaining photo ops of the “then Lancelot, Bedivere and I jump out of the duck” variety. Please, Just not in my backyard. 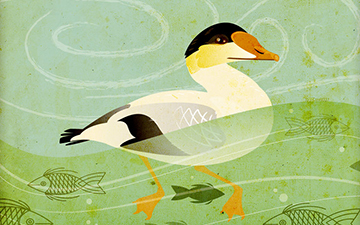 This entry was posted in The Art of Science and tagged alternative energy, Common Eider, Cophenhagen, David Ng, duck, eider duck, Energy Duck, hydroelectric power, Jessica Dixon, LAGI, Phylo, solar power. Bookmark the permalink. Reminds me of some of the things that the artist Bruce McCall comes up with for his New Yorker covers!